HOLLISTON, MA--(Marketwired - Oct 8, 2013) - ESCO Tool has introduced a portable welding end prep tool that features air-operated clamping which reduces cycle times for highly repetitive end prep milling in fabrication shops. The MILLHOG® Mongoose Air Clamp™ Welding End Prep Tool is equipped with an air-operated clamp that attaches to a tube or pipe I.D. and releases from it by simply flipping a toggle switch. Ideally suited for highly repetitive end preps, the pneumatic clamping system reduces operator fatigue and increases pipe milling throughput by up to 600%, claims the firm. 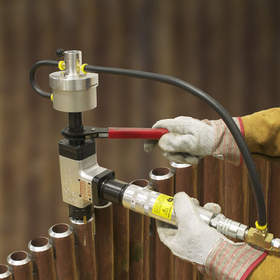 Featuring a self-centering draw rod that rigidly mounts into the tube or pipe I.D., the MILLHOG® Mongoose Air Clamp™ Welding End Prep Tool employs clamp ribs that retract off the mandrel automatically after milling to reduce friction. Designed for tubes and pipe from 5/8" I.D. to 3" O.D., this tool can bevel, face, and bore simultaneously and remove membrane. The MILLHOG® Mongoose Air Clamp™ Welding End Prep Tool sells for $3,995.00 and is available for rent in the continental U.S.A. The ESCO product line features their robust line of MILLHOG® welding end prep tools and Air-Powered Saws and specialty mount systems, High-Speed Hand-Held Bevelers, and accessories. Available for sale or rent, with 24 hour shipment or less usually available, these field-proven tools are built tough and precision machined from the finest materials to make sure that you get your job done properly, on time, and under budget. The MILLHOG® Mongoose Air Clamp™ Welding End Prep Tool is equipped with an air-operated clamp that reduces operator fatigue and increases pipe milling throughput by up to 600%.